How to use hyperlinks in a Klip – How can we help you today? Overview Hyperlinks help you navigate to external resources and to other dashboards within Klipfolio. Key Features Provide custom anchor text for hyperlinks. Use tab permalinks for dashboard navigation. Drag a component that supports hyperlinks into the Klip workspace. At Format as, select Hyperlink. Result: My Dashboard is now a link. To create a list of hyperlinks in your Klip, use the ARRAY function. For more information, see ARRAY function. In the formula bar, select the data element in the ARRAY function. Result: My Dashboard, Klipfolio, Support are now links. Every dashboard you create in Klipfolio has a permalink associated with it. To link to a different dashboard in your account, use the permalink tab ID. On your dashboard, select Library. Select a dashboard title from the list. You are now on the dashboard properties page. 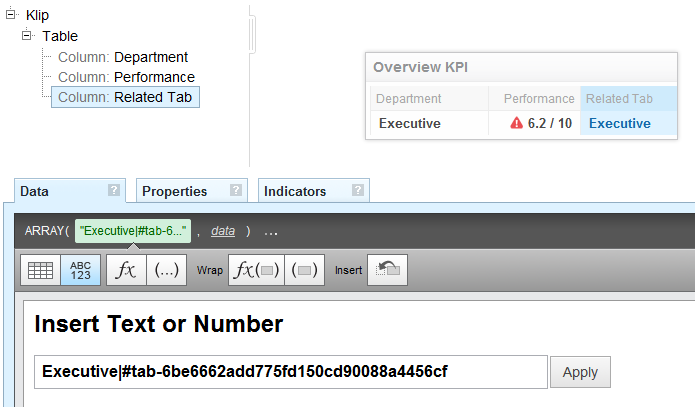 In the address bar, copy the dashboard ID to your clipboard. In the Klip Editor, select the Data panel. Select the Insert a literal string or number button. Result: Your dashboard is now a link. For more information on dashboards, see Working with dashboards.